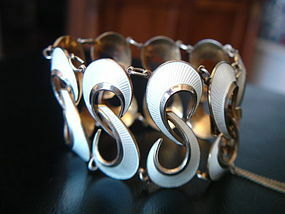 These are getting so hard to find.. a wide 1 1/2 Inch Hans Myhre Norway Guilloche Enamel Bracelet in Modernist Design. Length is appx 6 3/4 inches. Hallmarked 925S Norway and Anchor. Goldwashed. Light tarnish. Safety chain may be replacement.